Conservationists hoping to save the black rhinoceros population are planning to move several of the endangered animal from South Africa to a national park in Chad, where they haven’t been seen in more than four decades. The plan to reintroduce the black rhinos to the Zakouma National Park comes as poaching further threatens rhinoceros populations. According to the Guardian, the Johannesburg-based organization African Parks wants to transport five to 10 black rhinos to Chad next year. “Now that the park is under our management and we have a very strong and effective anti-poaching presence, we can consider the reintroduction of key species like black rhino, even if it has to be of a different subspecies, the organization’s chief executive, Peter Fearnhead, told the Guardian. 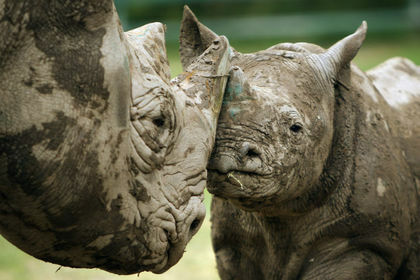 Once the “most numerous of the world’s rhinos,” the black rhinoceros is considered critically endangered. Its population dropped 97.6 per cent between 1960 and 1995 when the numbers hit a low point of just 2,410 black rhinos throughout Africa, according to the International Union for Conservation of Nature (IUCN). The IUCN indicated the numbers have risen over the past 20 years, but were still 90 per cent lower than what they were in 1960. Another conservation group, Save the Rhino, estimates the current population of black rhinos is 5,055 — almost all of which are found in Kenya, Namibia, Zimbabwe and South Africa. By comparison, Africa’s white rhinoceros population is estimated to be around 20,405. Rhino poaching in South Africa is happening at a record rate, with 1,215 killed in 2014. Poachers killed nearly 400 rhinos in the first four months of 2015 alone, according to data from the South African Department of Environmental Affairs posted on the Save the Rhino website. The animals are hunted for their horns, to be sold in countries such as China and Vietnam where they’re used in traditional medicines for everything from terminal illness to aphrodisiacs and hangover cures. According to a 2013 report in The Atlantic, rhino horn can sell for as much as $100,000 per kilogram. The average horn weighs between 1 to 3 kilograms, according to the article. There are some concerns about the plan to relocate black rhinos to Chad’s Zakouma National Park, the Guardian reported. “I would question if Chad is safe enough to risk placing any of the black rhino we have left at even marginal risk while we are losing rhinos at a rate of one every 7.5 hours even in heavy protection like South Africa,” said Derek Joubert, who helped transport 10 rhinoceroses from South Africa to Botswana earlier this year with a project called Rhinos Without Borders. “I think that one should indeed move rhinos from high poaching areas in South Africa and into places where the protection is more intense. If this is the case in Zakouma, then it makes sense,” he told the Guardian. African Parks has successfully relocated seven lions to Rwanda’s Akagera National Park earlier this year, reintroducing the first lions in the country since the genocide in 1994, Agence France-Presse reported in July. The organization wants to reintroduce black rhinos to Akagera, as well.